This is my go to recipe for chili. 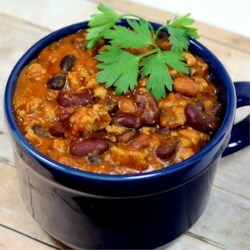 First off i would like to say that this chili is great when made exactly as the recipe is written! I have made countless batches of this recipe since I first found it about 3 years ago. I usually use 2 cans of black beans and only 1 of kidney beans. Sometimes I add a can of corn. I always top it with crushed Cheddar sunchips. I don't use onion and instead use onion powder but that is only because I don't care much for onion. Also, it can be made in about an hour on the stovetop.